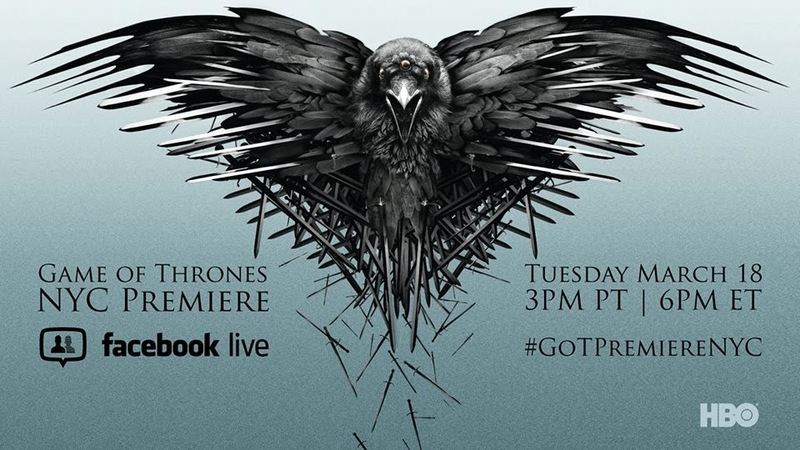 The Season Four red carpet premiere of "Game of Thrones" takes place this Tuesday, March 18 at Lincoln Center’s Avery Fisher Hall and for the first time ever, HBO is allowing fans to take part in this premiere event by live streaming the it via Facebook Live. The premiere will be attended by more than two dozen cast members including; Alfie Allen, John Bradley, Gwendoline Christie, Emilia Clarke, Liam Cunningham, Charles Dance, Peter Dinklage, Aidan Gillen, Jack Gleeson, Lena Headey, Conleth Hill, Kristofer Hivju, Sibel Kekilli, Rose Leslie, Rory McCann, Michael McElhatton, Pedro Pascal, Diana Rigg, Sophie Turner, Carice van Houten, Maisie Williams, Isaac Hempstead Wright and more. So how will this work? From the release, "Fans will be able to participate by sharing questions via Facebook and Instagram, which will be answered by cast members live from the red carpet from 6:00-7:00 p.m. ET., Fans can go to Facebook.com/GameofThrones and FacebookLive.com to watch all the glitz and glamour of the red carpet from anywhere. The live stream will also be offered by participating affiliate partners via their online and social sites." Stay tuned after the coverage for a new, exclusive Season Four trailer on Facebook at 7:00 p.m. ET. Be sure to follow "Game of Thrones" on Facebook and on Instagram not only to participate in this event, but also for news updates and exclusive photos. The fourth season premieres on HBO April 6 at 9 p.m. ET.